"I want to tell you that our stay could not have been more enjoyable. Thank you to everybody involved. We will not hesitate to use you again for future rentals. Thanks!" Impressive, classy in-town Bozeman home in the historic district. Four bedrooms and three and a half bathrooms. The home sits on 5 city lots! It has a large yard and a great patio for all your dining needs, and for enjoying a cup of coffee in the morning! The Cleveland House has high-speed wireless Internet for your convenience. NEW FOR SUMMER 2018: Gorgeous fourth bedroom with a king size bed, reading nook, gas fireplace, and a full bath that features a claw foot tub. It's the perfect place to sneak away. The master bedroom has been upgraded to a king size bed. 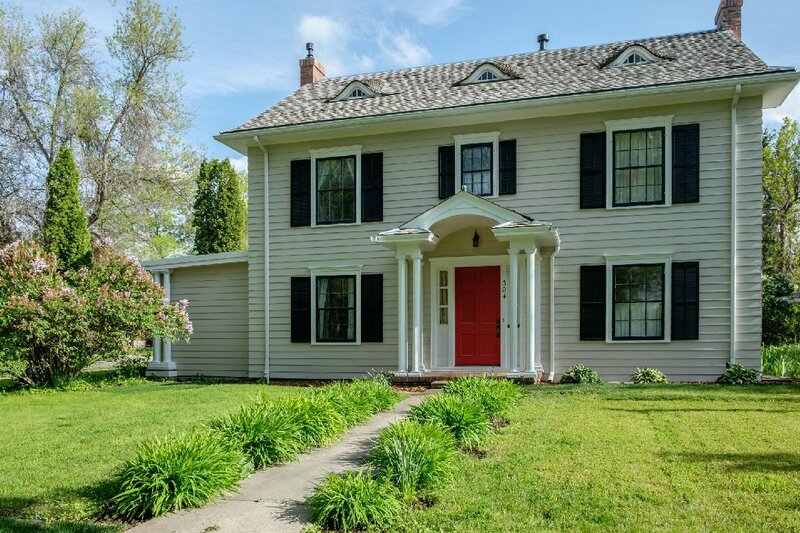 BRIEF DESCRIPTION: The Cleveland House is a historic 1906 Bozeman south side home with recent renovations both inside and out. 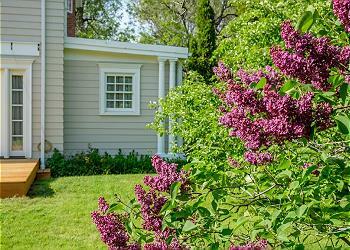 It is located in the beautiful Bon Ton Historic District made up of lovely homes and quiet tree-lined streets. This home is in walking distance to both downtown and Montana State University. With a combination of antiques, modern furnishings and interesting original artwork, this home has a relaxed upscale feel. BEDROOMS AND BATHS: The home has four bedrooms and three and a half baths. The master bedroom has a king size bed, walk-in closet, and a beautiful attached bathroom with both a walk-in shower and claw foot tub. 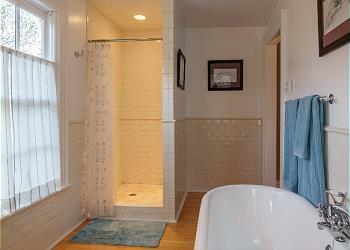 The other two bedrooms on this level share a full bath with a tub/shower combination. One has a queen size bed and the other has two twin size beds. The newly added fourth bedroom has a king size bed, sweet reading nook, a gas fireplace, and an attached bathroom with a old fashion claw foot tub, sink and toilet. The fourth bath is a powder room on the main level. 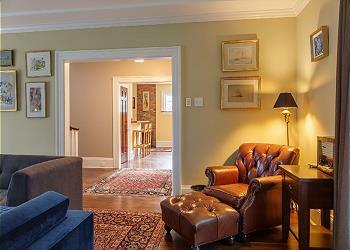 LIVING ROOM: The living room and attached library are both comfortably furnished and each has a beautiful fireplace. (The library’s is gas fired, the living room is decorative only). The living room has large French doors that open to the back yard so you can get a nice breeze throughout the home on summer evenings. The living room has a TV with ROKU, Amazon Prime and Netflix along with broadcast channels. There is also a great collection of DVDs, as well as a stereo system with a CD collection and in-ceiling speakers throughout the house. 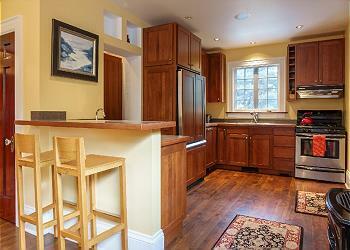 KITCHEN: The kitchen is very well equipped and includes a microwave, dishwasher, a wine cooler and a walk in pantry. There’s also a free standing gas fireplace between the kitchen and dining area to make it cozy on chilly winter mornings. DINING AREA: The dining room is just off the kitchen and has seating for eight guests. There are stools at the kitchen bar for overflow, and there is a picnic table on the patio for outdoor meals. SETTING: The home sits on five city lots in a quiet historic neighborhood on the south side of Bozeman. You are walking distance to a wonderful local market, to the MSU campus and to downtown. It’s a great location! OUTDOOR AMENITIES: The spacious patio has a lounge area, with an outdoor couch that comfortably seats 6 and an additional 4 deck chairs, and a dining area with a picnic table and an umbrella. There is also a gas barbecue grill on the patio and a huge back yard for an in-town home! CLOSEST TOWN AND AIRPORT: You’re about ten blocks from Bozeman’s Main Street (a beautiful walk through the historic neighborhoods) and about 9 miles from Bozeman’s Yellowstone International Airport. ACTIVITIES NEARBY: Bozeman is a mecca for outdoor activities. You’re just a few blocks from our wonderful trail systems for biking and walking. Mountain hiking and whitewater rafting are nearby. There’s fishing on the nearby East Gallatin and main Gallatin Rivers, horseback riding, tours of Yellowstone National Park and more. The home is about an hour and a half scenic drive from Yellowstone’s entrances at both Gardiner and West Yellowstone. Warm and cozy Family home! Really great home for our family! Wonderful art on the walls, great common areas and the master bath was beautiful! We very much enjoyed our stay! 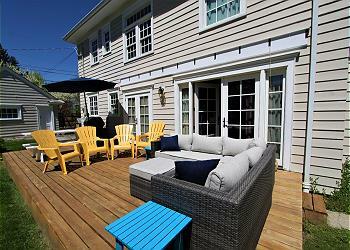 Great location, very nicely kept, even has a backyard for entertaining! We loved it and will be back. This home is as nice as the photos indicate. The attention to detail of each room and the outdoor space are fantastic. The home is spacious yet cozy. Close to everything but just enough off Main Street. I would go back there in a heartbeat! Lovely house at a great location! We had a wonderful stay here! The location is perfect, just a few blocks from downtown, the university and a short drive to hiking and skiing. The house is big, warm and cozy. The kitchen is well equipped and clean. We would love to come back and stay here again. The Cleveland house is awesome! My visiting family has stayed here numerous times. It is always such a treat for us to spend time together in a quality home. Everything is here that you need for a wonderful visit in Bozeman! Beautiful home in an excellent location. Great house and kitchen. Easy to get to shops and restaurants in downtown Bozeman. Hour and a half drive to Yellowstone. This was a great place to stay, will look for it next time we am in the area! We have stayed at this lovely home numerous times and have consistently had an exceptionally positive experience. It’s a beautiful, updated and inviting home—spacious, clean and comfortable, with a nice deck and backyard for outdoor enjoyments—conveniently located in an attractive & quiet neighborhood within walking distance to town. A great place for a brief or extended stay! This property is amazing! We live around the corner and have rented it for overflow family. Immaculate, tasteful, well appointed, easy. Thank you for making this available,, it would be perfect for a large reunion-type group with the upstairs bedroom newly available! We have grandchildren in Bozeman and are there often. This property was terrific. Clean as a whistle and well equipped. Thank you so much for your wonderful review of Cleveland House! it is the goal of the homeowner and Mountain Home Vacation Rentals to have the cleanest properties and to make sure the home is well equipped and comfortable for every guest. Whenever you are ready to start planning your next trip let us know. We would love to help you find the perfect place for your group’s next adventure! Thanks so much and have a wonderful day! We stayed in the house in March during a spring break trip. It is beautiful, stays cozy warm in the cold and snow and has all of the comforts of a lovely, well maintained historic home. The location is convenient to Bozeman's great downtown, the university and hiking trails. The neighborhood is beautiful and quiet. Thank you for your wonderful review of the Cleveland House! We are so very glad that you and your group had such a great time at the home. We love hearing that people enjoyed our properties! Let us know whenever you are ready to plan another trip to Montana. We would love to help you find the perfect place for your next getaway. Thanks again and have a wonderful day!